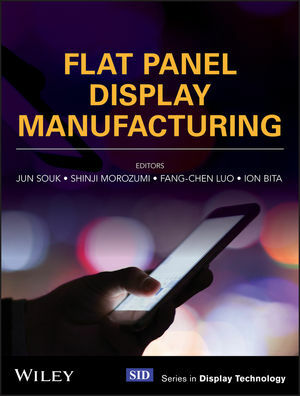 This book provides a broad overview of the manufacturing of flat panel displays, with a particular emphasis on the display systems at the forefront of the current mobile device revolution. It is structured to cover a broad spectrum of topics within the unifying theme of display systems manufacturing. An important theme of this book is treating displays as systems, which expands the scope beyond the technologies and manufacturing of traditional display panels (LCD and OLED) to also include key components for mobile device applications, such as flexible OLED, thin LCD backlights, as well as the manufacturing of display module assemblies. Flat Panel Display Manufacturing fills an important gap in the current book literature describing the state of the art in display manufacturing for today's displays, and looks to create a reference the development of next generation displays. The editorial team brings a broad and deep perspective on flat panel display manufacturing, with a global view spanning decades of experience at leading institutions in Japan, Korea, Taiwan, and the USA, and including direct pioneering contributions to the development of displays. The book includes a total of 24 chapters contributed by experts at leading manufacturing institutions from the global FPD industry in Korea, Japan, Taiwan, Germany, Israel, and USA. Flat Panel Display Manufacturing will appeal to professionals and engineers in R&D departments for display-related technology development, as well as to graduates and Ph.D. students specializing in LCD/OLED/other flat panel displays. JUN SOUK, PHD is a Professor in the Department of Electronic Engineering, Hanyang University, South Korea. SHINJI MOROZUMI, PHD is the founder and chairman of Crystage Inc., Japan. FANG-CHEN LUO, PHD is advisor to the President and Fellow of AU Optronics, Taiwan. ION BITA, PHD leads development of display technologies and components at Apple Inc., USA. "If there is only one book on flat panel displays that is going to be on your bookshelf, then I would highly recommend this one. It will be a text that you refer to time and again for clear and concise explanations of how LCD and OLED displays are constructed and the processes used to make them into commercially successful products. As you use it, you will find yourself drawn in by the clear and colorful illustrations and will find it hard to not read more than you first intended."